Ed Brubaker, Steve Epting and Mike Perkins check in this month with Captain America #29, the fifth installment in “The Death of the Dream.” There’s a lot going on in this book at the moment, especially considering the marquee character bit the bullet several issues back. The artwork of Epting and Perkins is best suited to a story with simple gunfights, deep characterization and a minimum of hands-and-fists action, and that’s almost exclusively what they’re given to work with here. In the few occasions that they are asked to delve into more traditional comic book action sequences, their collaborative style just doesn’t hold up. They reach for supreme realism above all else, and that doesn’t mesh well with the idea of a man in a skin tight, red and white avian-themed costume throwing kicks and punches at a gentleman with a flame thrower. When they’re in their element, however, these two can deliver some really nice work. Their rendition of the city of New York is breathtaking – a sea of lights, bricks, mortar and concrete – and their knack for creative camerawork really emphasizes that strength. When the Winter Soldier is infiltrating an enemy’s operation at the pinnacle of a downtown skyscraper, clinging for dear life to a dangling American flag, the effect is both dizzying and captivating. While their style may not have the kind of flash and personality to catapult them to the top of the artistic heap, the subtleties of their work are worthy of some praise. For the most part, they’re right at home in this kind of an espionage book, although writer Ed Brubaker does ask them to fill an awful lot of pages with talking heads and computer monitors. Epting and Perkins’ work is a great match for the mood this series evokes, although I wonder if it will hold up once Cap makes his inevitable return from the grave and the focus shifts back to more traditional costumed fare. Brubaker’s script for issue twenty nine is very, very complex. He aims to tell an epic, involved, detailed story filled with twists and turns, but that’s tough to do in brief monthly installments like this. Maybe it all makes sense in the long run, but as a fresh reader coming in midway through this story arc, I was completely and utterly lost within the first six pages. This is obviously an extremely layered, delicate storyline and the actual writing within the issue is compelling, but when I had trouble following the “previously in Captain America” blurb, I knew it meant trouble. It’s difficult to tell who’s on which side as the tale progresses, as well. Between Tony Stark, the Black Widow, Sharon Carter, the Falcon, the Winter Soldier, the Red Skull and Crossbones, there seem to be no less than four competing alliances and coalitions, and that’s just within the confines of this issue. It’s one thing to spin a yarn with depth and unpredictable twists, it’s another to tie a knot and confuse your audience. 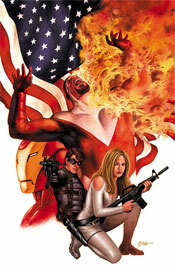 I fear Brubaker may have grown a bit overambitious here. If you’re a longtime Cap follower, or the kind of reader who prefers to wait for the collected edition to hit store shelves, this story may be right up your alley. It’s interesting enough that I’m curious about the full story, and may grab up the trade myself if and when it arrives in my local shop. As a standalone, though, it has quite a few shortcomings. If you’re brave enough, borrow it from a friend and try to comprehend what’s going on. It’s got potential.